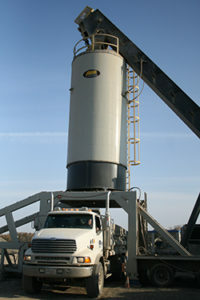 Companies that add asphalt production to their product offering cite many reasons for doing so. These include a need to better serve its customers, a desire to expand its list of capabilities, dissatisfaction with bottlenecks caused by supplier delays, and more. For Hoban Equipment Limited (HEL) the company saw a real niche that could be established. Companies that add asphalt production to their product offering cite many reasons for doing so. These include a need to better serve its customers, a desire to expand its list of capabilities, dissatisfaction with bottlenecks caused by supplier delays, and more. HEL’s strategy has proven sound as the company wraps up its first season as an asphalt producer, made possible with the addition of a 250 tph plant from Asphalt Drum Mixers. In that inaugural season, they’ve not only played a key role in paving a large section of the Trans-Canada Highway (TCH) in Saskatchewan, but they’ve also taken their business to a whole new level. Established in 1966 and headquartered in Salmon Arm, British Columbia, Hoban Equipment Ltd. has built a solid reputation throughout the region for its expertise in road and subdivision construction, mine and landfill reclamation, and work with wildlife sites. In addition, the company has supplied both its own and other operations through the operation of ready-mix plants and the aggregate sites used in support of those plants. According to project manager, Mike Tiffin, making a move to add asphalt simply made sense. Because they were looking to gain market share in areas outside the province of British Columbia, HEL chose an EX8842, which packs an impressive 250 TPH production into a portable plant. “Management was looking for HEL to expand far beyond their existing range of operations and capture as many key growth markets as they could,” says Tiffin. Hoban’s rationale for looking eastward toward Saskatchewan was a sound one. The province is rich in resources such as coal, oil, natural gas and potash, and until recently, had maintained controls, which discouraged capitalizing upon these natural gifts. A new progressive government has opened up those resources, resulting in a nice influx of cash into the province. To ensure that a supply of asphalt would not be an issue for any HEL client, regardless of where the projects are located, management knew that a portable asphalt plant would be the only way to go. Setup can often be a sticking point in any move to a new plant, with everything from planning on delivery to the actual erection coming into play. According to Tiffin, they were impressed with ADM’s handling of the entire plant setup process. “Things could not have gone better from our perspective,” he says. “The silo erection and the lime erection equipment was outstanding and we were really impressed with the system on the silos for material load out. The whole process, though, was made better in part because of the help the crew from ADM provided. They’ve run plants before so they understood the challenges and the aches and pains you go through to get a plant up and running. It’s obvious that they are not just office workers who came out to direct things. That meant a lot to us and allowed us to be ready when we needed to be. HEL’s plant includes a 88” X 42’ drum with ADM’s patented counterflow technology which utilizes separate drying and mixing zones to maximize heat transfer and fuel efficiency. 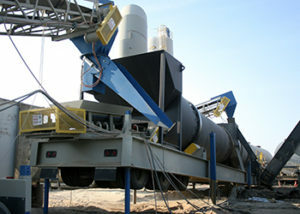 This design raises asphalt production volumes while lowering costs-per-ton. Other components of the system include a 47,000 acfm baghouse, a four, 30-ton cold feed bin system, a 75-ton self-erecting silo, a 400 TPH drag conveyor, a pair of 30,000 gallon hot oil heated AC tanks, a 750 BBL self-erecting mineral filler silo, and a 15 ton RAP bin. The TCH project to which Tiffin referred above, had a requirement upon it that the asphalt mix contain 30% Recycled Asphalt Product (RAP), a stipulation that, with some plants, could have presented challenges. The ADM plant, he says, handles the RAP without any problem. Satisfaction extended beyond the asphalt production phase of the project as well, with Hoban’s crews laying down the 17 km of roadbed on schedule, within budget, and in spec. Hoban is currently tearing down the ADM plant in preparation for the next project. Tiffin says during the winter season they will perform general maintenance on the plant’s components, before putting it back on the road again in spring.